Margaret Cardillo is the author of the new children's picture book Just Being Jackie, which focuses on the life of Jacqueline Kennedy Onassis. 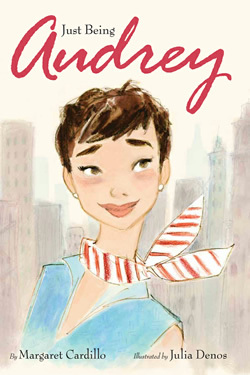 Cardillo also has written Just Being Audrey, about Audrey Hepburn. 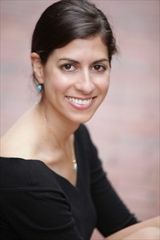 She teaches screenwriting at the University of Miami. 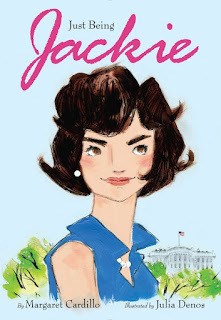 Q: Why did you decide to write a children's picture book about Jackie Kennedy? A: For my first book, Audrey Hepburn was such an obvious choice. I had dressed up like her for my middle school character parade and she had been a role model for me since I was young. With Jackie, it was different. Of course I had discussed a second book with my editor. We wanted someone who had a compelling story, who was a strong woman, who perhaps overcame something in her life, and who was philanthropic. We also wanted someone iconic, both in fashion and with her presence. Jackie Kennedy came to the forefront pretty quickly. It's important to note that I have been writing for years with a single black and white framed photo above my desk: Jackie aboard Air Force One, wrapped in a blanket, her shoes kicked off with her feet propped up on a seat, reading On the Road by Jack Kerouac. It's completely candid, and it speaks volumes about Jackie's personality and passion for books. My husband gave it to me when we were still dating. I loved everything about that photo the moment I saw it. She was enigmatic to me. I had always had a certain vision of Jackie, but something about the way she is sitting and the fact that she's reading the rebellious Kerouac changed the way I looked at her. There truly is so much more to her than meets the eye. Q: Which of Jackie Kennedy's characteristics did you choose to focus on in the book, and why? A: With Jackie it became quite clear that she was incredibly intelligent, witty, cultured and that she loved to read. What better thing to focus on for a children's book than a person who loved to read! So I knew that would be a major theme of the book. She really embraced her role as an ambassador for America. She was a private person, but she knew the importance of going out in the world and being with and knowing people from different cultures. She was constantly learning. As much as she may be known for being the president's wife, she was always very much herself. She also knew how important her role was as the widow to a beloved president. I think Jackie's legacy is this symbol of pride: in herself, in her intelligence, and in America. She made the jump from being proud to showing pride in an incredible way. And of course, there's the fashion. I absolutely cannot underscore enough her sense of style. It's hard not to drool over Julia Denos's fashionable renderings of Jackie's outfits. I wouldn't mind having some of them in my closet. But her style ran deep. Jackie was extremely well mannered and always dressed and presented herself in an impeccable way. There's a lot to learn from that as we go out in the world to follow our passions. Q: Can you say more about what you think Julia Denos's illustrations add to the book? A: What DON'T they add to the book?! I consider myself the luckiest author in the world to have Julia doing illustrations. As soon as I saw her work on Audrey I wanted her to illustrate my whole life. I just adore her and her art. Q: What do you hope kids take away from Just Being Jackie? A: I loved writing a book about someone who loved reading. So, I hope they take away that message. But I also hope they see a strong, independent, smart woman who did her own thing. I hope they learn from her that being smart is wonderful and should be embraced and nurtured. I hope they see a person who was strong even in the face of adversity or tragedy. And they learn from her how to get back up on that horse, literally and figuratively. I also hope they learn to recognize the importance of history and culture in our society. A: I am working on another biography. Stay tuned! I also just sold another children's book but it has nothing to do with women. It's a book about dogs!